I was pretty excited, as I am sure the rest of the Tuesday with Dorie bakers were when they found out that Dorie would be our lovely hostess for this weeks challenge. Dorie, is the queen of baking, in my humble opinion anyhow. I was equally as excited when I found out that Dorie picked the French Pear Tart. 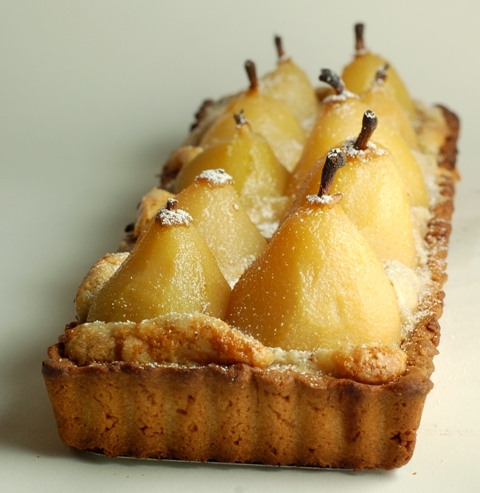 I have been dying to make this Pear Tart all winter, and have not had a chance. It would be the most impressive dessert to bring to a dinner party that we had to go to on Sunday. The recipe calls for a simple tart crust filled with an almond pastry cream and then topped with pears – simple. The tart dough was a classic French Sable otherwise known as a shortbread dough. It is very simple to make especially if you use the food processor as I do. As well you do not have to roll out this dough but rather mold it into your tart pan. I did freeze it for a couple hours before baking which caused it not to bubble or raise during baking. The recipe called for the option of using canned pears, which evidently most pastry shops do, or we could poach our own. I knew I had to poach my own and I knew that I had to use the cute little Seckel Pears I had previously seen at Bi-Rite market. I wanted to add a little something extra so I threw some Cardamon pods in with the pears when they were simmering. Poaching was so much easier then I thought it would be and I can only imagine all the creative things one can do with flavorings as well as color. The pastry cream called for a bit of rum and I used a spiced Jamaican rum hoping it would compliment the Cardamon. When putting the tart together I decided to leave the pears whole since they were so cute and I wanted everyone to enjoy the dynamic look I was hoping for. The tart finished up nicely. The crust was a bit heavy (per my food critic Lenny) but otherwise, the flavor combination and the freshly poached pears were heavenly. I really enjoyed making this tart, as it was very easy, incredibly flavorful and the presentation will WOW your guests! Thank you, Dorie, for a wonderful challenge. 36 Responses to "French Pear Tart"
How pretty. What a work of art!! I love the look of those whole pears!! They are wonderful and oh so classy! Glad it was enjoyed! That's beautiful! And the cardamom was a great idea. I bet it really went well in this. Superb... and very, very French looking! I guess that was the goal! LOL There is something about pear stems I find very fancy... that's why I kept them too! Wow, this looks fantastic. GReat job! wow - the presentation is just... divine! Andy and I were on the delicious site of this one! The pears were perfectly tender and the filling was just right. I agree with Denise that the crust came out a bit heavy. I applaud you for trying the whole pears, it makes this tart far more superior than any of the others. Well done on a great job! 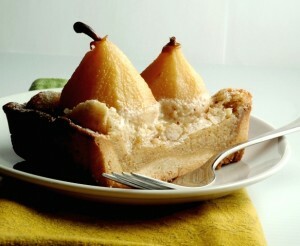 That is stunning in a rectangular tart pan and the whole pears are gorgeous! Well done! Your take on the pear tart is absolutely stunning. I love how you kept the pears whole. Gorgeous. ooh la la: that looks gorgeous! I just love the look of this tart- like poached pears in a woven basket! What a great idea to stand up the pears...very attractive! Your tart looks delectable! Those pears are just toooo cute! I love that you left the pears whole. Beautiful presentation! You did a remarkable job! So VERY creative!!!!! Thats a show stopper right there. GORGEOUS dessert! Well done. Fabulous! Fabulous! Fabulous! Your tart is absolutely stunning! I love the look of the sweet little pears standing upright in the almond cream and I bet the cardamom was perfect with the almonds and fruit. BRAVO! Your tart looks lovely. What adorable little pears! I absolutely love this! I have a tart pan that I only use once a year for Thanksgiving, so this is going on my list for a surprise gift for hubby, he loves his pears! Thanks for this! The whole pears are adorable! Nice job. Oh my! That is gorgeous! I'll bet it was the highlight of the party. Oh my! Are pears in season now? Summer is indeed long gone. Sigh. But this tart is absolutely gorgeous. I've never made a pear tart with poached pears standing up like yours. This is certainly something I will have to try. Beautiful tart, Denise. Hello, it's an excellent write-up, and great thought. Hi Dee! That is a classic recipe isn't it? I just reposted the link to Dorie's recipe - here it is as well. http://doriegreenspan.com/2009/01/tuesdays-with-dorie-french-pear-tart.html Happy Monday. The link to the recipe is broken - can you repost? Looks like a fabulous recipe and would love to try. Unfortunately that link was to Dorie Greenspan's site and it seems her link is broken. Since it is published in one of her books, I cannot feature the recipe on my site without her consent. I am sure if you reach out to her she would gladly give it to you.